Accent lighting is a small feature that can make a huge difference when illuminating your yard or home. Whether you want to light a path or simply enhance the evening curb appeal of your home, you can use renewable energy to achieve your goal. At West Coast Solar, we’re emphatic about green energy and its uses around the home, inside and out. In the following blog, we’ll be discussing the various types of accent lighting to help spruce up your home’s external appearance during the evening hours. We’ll also be discussing how you can power your lighting with solar to continue helping the environment and keep energy costs low. It’s a simple feature you can add to your home to enhance your evening curb appeal. You may not be putting your home on the market, but your home will look friendlier, nicer, and easier to access for family or guests. Accent lighting illuminates certain features on the front or back of your home like a path, shrubbery, windows, trees, or a pond. The accent guides the eyes as the person is approaching, and it accentuates the beautiful features of your home. You may be wondering if lighting will decrease the safety of your home? In most cases, the lit houses are less likely to be targeted since the entire home’s front is visible with lighting. The homes who leave their lights off or do not have front yard accent lighting tend to be targeted more often. If you’re concerned with for the safety of your home, call your local authorities and report suspicious activity. Do you enjoy inviting friends, family, and colleagues over for social events at your home? Most guests enter your home through the front door. What if they can’t see the path their walking on to get across your front yard and onto your front porch? Do you have a pond or feature in your front yard people tend to not notice and walk into? Accent lighting adds safety to your family’s and your guests’ journey across your front yard, whether on a path or through the grass. Keep your family and friends safe. Keep your front yard lit. You may be thinking, “adding more lighting means more energy usage.” You are correct; however, there are smaller solar panels for smaller features or energy usage available to you and your home. This means you can add a series of accent lighting to your front yard, power it with renewable energy, and enjoy the benefits of an illuminated curb appeal while also keeping costs low or non-existent. Not only do accent lights require energy to function, but if you install them via the traditional route, you’ll be digging a trench to lay wire from your electrical service panel. If you don’t install the lighting yourself, you will incur costs like wiring, grass replacement, labor, and a slightly higher utility bill. You can use solar panels to power your accent lighting. You will be responsible for the cost of installation and labor, but you won’t have to worry about tearing up your yard or rising utility costs. The accent lighting will be completely independent of your utilities. 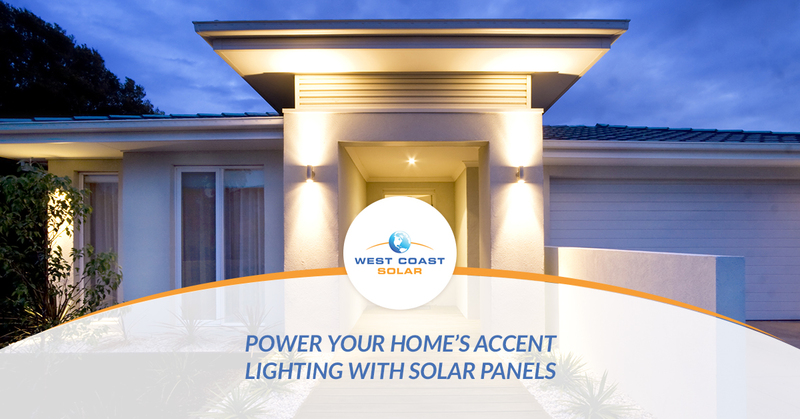 If you already have a solar power system, you can tie in the accent lighting into the system, which would require some wiring installation, but it’s an alternative to traditional energy use. You can trust our professional solar technicians to help you find the best solution to your accent lighting. Switch to Solar Energy and Save! You may be wondering what it would take to add a solar energy system to your home. It’s a simple process. West Coast Solar will set up a consultation with you to determine your annual energy use, your roof space, and various other topics to ensure you get the best Solar Power System possible. Once everything is decided, financing is secured, and we’ve agreed on an installation time, your system will be installed. Once you are able to use your solar system, you will begin to reap the benefits of renewable energy. You will rely less on traditional energy sources. If you’re looking for a simple solar solution to your front yard accent lighting, we can help. We’ve been serving Northern California for more than a decade, and we know what it takes to install solar energy to reduce costs and help the environment. Your home’s evening curb appeal is important, not only for aesthetics, but also for safety, security, and energy use. If you want to discuss solar panel installation or simply have more questions to ask, give us a call today! We’re always here to help you with your solar energy needs.